grammar school at St. Francis and then graduated from South High in 1964 where he was a member of the school’s first ever SYL Championship football team (Class C) in 1961. Sheriff’s Office for 32 years. After retiring in 2002 he began a 10-year teaching career at Porterville JC, teaching Criminal Justice. the River community. He served 14 years as a Trustee with the Beardsley School District and started coaching youth baseball at NOR. He developed his love and commitment for North High when his kids began attending school in 1984. He was a tireless volunteer for the North high Athletic Boosters Club for 8 years, serving as the President for 3 years. He took on the job of reorganizing the Booster Club Bingo fundraising and along with the help of North High “Hall of Famer” Greg Fowler remodeled the Bingo Hall on Knudsen Drive. In addition, Stan spent many hours helping on the North High baseball fields while his sons were part of the program. After his boys graduated from North , he began a 17-year baseball coaching career working for Tony Silver. He was the Freshmen coach for 8 years then served under Silver on the Varsity for 9 more years. But maybe his biggest contribution not only to North High but Kern County baseball as well might be his devotion to the annual Terrio Therapy Spring Classic Baseball Tournament. Tony Silver started the tournament and then turned it over to Stan who has run it for the past 29 years. It has raised over $260,000 for the North High baseball program during that time! It continues to be the biggest high school baseball tournament in the area. of ’91) and Carrie (Class of 94) all graduated from North and were all athletes. Congratulations Stan and thanks so much for all your wonderful contributions to North High. 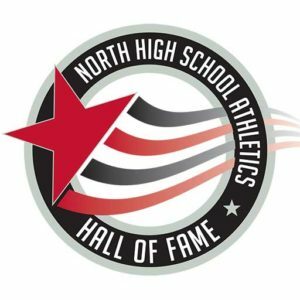 The sole purpose in the formation of the North High School Athletics Hall of Fame is to keep alive and to pass onto future Stars the unique expierences of our former athletes, coaches, and contributors. This legacy is paramount to the growth of all who are touched by the North High athletic program. The pride that is carried throughout life stemming from being a part of this history and legacy, no matter one’s role, is what it is all about.